Full-service engineering for the modernization and expansion of an administration building on a manufacturing campus. The project entailed a gut and reconstruction of the three-level, 66,000 sq. 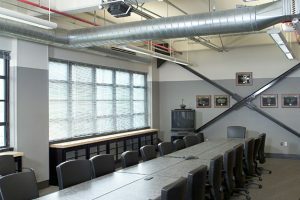 ft. 1940-vintage corporate headquarters into modern class “A” office space. The scope of work also included a 6,000 sq. ft. addition for an expanded tour center.